Where do Americans get their news about politics and government? And how does the media environment intersect with political polarization? A Pew Research Center study based on a representative online survey finds striking differences in news habits along the ideological spectrum. Examine the ideological profiles of the audiences of news outlets. Explore survey results to see which sources are recognized, turned to, trusted and distrusted. Source: American Trends Panel (wave 1). Survey conducted March 19-April 29, 2014. Based on all Web respondents (representative of the 89% of Americans with internet access). Each graphic shows the ideological distribution of all respondents who got news about government and politics from the source over the course of a week. Sizes of each graphic reflect the relative sizes of their audiences, which can also be seen in the reference graphic on the top right of the page. (Overall N=2,901; sample sizes for consumers of each source available upon request.) Ideological consistency based on a scale of 10 political values questions. Updated 10/21/14: Graphic updated to align visual representation of five segments of ideological spectrum with underlying data. All data labels and percentages are unchanged. The table below shows the share of respondents who have heard of each of the 36 media sources in the study, as well as the ways in which name recognition varies depending on a person's ideological preferences. On average, those with consistently liberal political values have heard of more sources than those in other ideological groups. Where do Americans get their political news, and how does this search for information differ across the conservative to liberal spectrum? Panelists were asked whether, over the course of the previous week, they got news about government and politics from each of the 36 sources listed below for news about government and politics. The sortable table shows where the left, right and those in between go to learn about what's going on in Washington and across the nation. The study sought to measure not just whether people have heard of a variety of news sources, but which ones they trust. 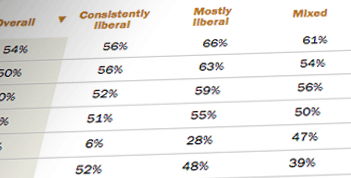 nine sources are trusted by 50% or more of consistent liberals. That compares with four sources trusted by at least half of consistent conservatives. Three outlets, CNN, ABC News and NBC News, are trusted by at least 50% of all panelists. It's worth noting that the 'distrust' numbers may be low for some lesser-known outlets mainly because many respondents have never heard of them, rather than because most respondents trust them. The study attempted to measure not just whether people had heard of a variety of news sources, but which ones they really trusted when it came time to get straight info about politics and governments. There is not a single news source distrusted by at least half of all panelists or those with mixed or mostly conservative views. Six sources are distrusted by 50% or more of consistent conservatives and four are distrusted by most consistent liberals. It's worth keeping in mind when reading the table that the 'distrust' numbers may be low for some less well known outlets mainly because most respondents have never heard of them, rather than because most respondents do not trust them. For each of the news media sources listed below, respondents were asked whether they have heard of the outlet, gone there for news in the past week, and whether they consider it trustworthy. Not surprisingly, by virtue of their greater familiarity, the most well-known sources also tend to be the sources trusted and consumed by the greatest percentage of political news consumers. Overall, panelists trust more sources than they distrust. On average, respondents with consistently liberal political values turn to more sources for news about government and politics than do those in other groups. They also trust more sources than do other groups. Nine of the 36 sources are trusted by more than 50% of consistent liberals. On average, respondents with mostly liberal political views have heard of fewer sources than consistent liberals. The most trusted sources among this group are similar to those of respondents overall – but they trust these sources at higher rates. Respondents with a mix of conservative and liberal views trust more sources than they distrust. They also tend to gravitate toward both broadcast and cable television sources for news about government and politics. On average, those with mostly conservative political values trust and distrust about the same number of sources. No news source is distrusted by a majority of this group, though 15 sources draw more distrust than trust. Those with consistently conservative political values are united around a single source – Fox News – in a way that no other ideological group is. Overall, 24 of the 36 sources surveyed draw more distrust than trust among this group. Source: American Trends Panel (wave 1). Survey conducted March 19-April 29, 2014. Based on all Web respondents (representative of the 89% of Americans with internet access). (Overall N=2,901; see About the Study for sample sizes of each ideological group.) Respondents were asked which (of 36 sources for news about government and politics) they have heard of, trust, distrust and got news from in the past week. Ideological consistency based on a scale of 10 political values questions. To see audience profiles, click each source. *Note that ThinkProgress, Daily Kos, Mother Jones and The Ed Schultz Show do not have audience profiles because the sample sizes for these audiences are too small to analyze. Compare News Sources: How many …?